Umbrella Academy just won the Harvey Award of Best New Series. Vasilis won for Best New Talent! To see the full list of nominees and winners, click here (Thanks Heidi). Some times, the pencil art is almost the same as the final inking, but sometimes it's so loose, and there's so much left only for the pen, for the brush and for the cruel mistakes that we make once we're using tools we can't erase. Who will survive the PIXU? You can pre-order both PIXU 1 and PIXU 2 at this link here. Finally, original art for sale! Ever since we started working on high profile projects like Casanova, Umbrella Academy and Sugar Shock, we've been getting mail about selling original art. Since we live in Brazil and it's not an easy task to deal with shipping and money transactions, we only have done this sort of thing personally when we go to San Diego. Well, we're very glad to announce that we have some pages available for sale with the nice folks from Beguiling, in Toronto. They have some pages and art cover from all the projects above. If we like how this goes, maybe it's the way to make everyone happy after all. There I was, in San Diego, going to the DC booth to check with Bob Schreck what time was the Vertigo panel I was suppose to go to announce that Bá and I were doing a series for Vertigo. As I arrived, to my surprise, Bob had printed copies of the first issue of Daytripper in hand, and he was showing it to a girl. A woman, actually, but I call women girls all the time. Turns out she was a reporter and she was asking him questions about the series, and since I turned out at that time, I was interviewed as well. Call it fate, I call it strange. It's okay, I'm used to strange. Have you met my brother? Anyway, the article is up at newsarama, and it's the first time we (I) had to talk about what the series was about and how was it working on it. I think I did pretty good right there on the fly, and I'm sure I was a lot more nervous twenty minutes later on the Vertigo panel. Bob made me look good, though. So, click here on the link and read alway. Have you pre-ordered PIXU 2 already? You should. The story unfolds, the characters interact, everything comes together and the story ends. It's coming and when it arrives nothing will ever be the same. -Finishing an issue of Umbrella Academy tonight (which means inking several pages), and doing a cover tomorrow. 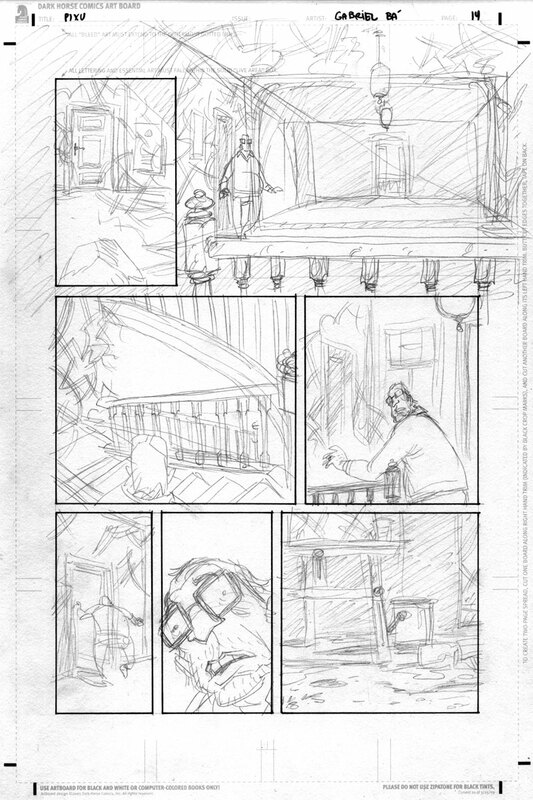 -Working on Daytripper script over the weekend, and going back to drawing pages during the week. 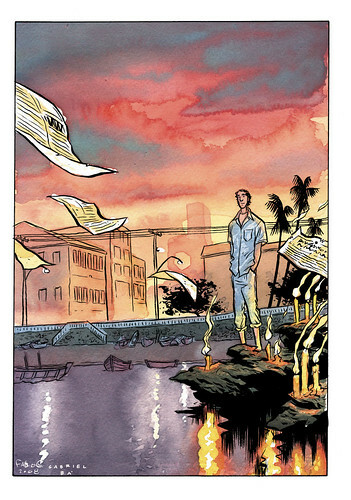 -Reading the BPRD 1947 script. Read it once already, and it's good. -Thumbnailing the "one page a month" story we do for a brazilian magazine so we can draw it tomorrow. - We started a weekly comic strip in one of Brazil's biggest newspapers and the first was published today. And you know what? That's just the beginning. It's time to do it and it's up to you. We'll be falling off the face of the world for a few weeks. New comics must be made, and written, and drawn, and it's up to us to do it (our part, at least). A good artist creates art and the art is a reflection of his world, and so we must live in this world and interact with people, but at the same time we must learn to respect the attention that is required to produce new work, and to pay attention, there are times when we must focus. Imagine if we lose this window of opportunity? We love comics. To be able to draw and write comics every day is amazing. To be able to communicate with others with stories you tell is the best job in the world. While we're at the drawing board, send your email to us and we'll answer them the best that we can, but if we don't, it's just because we're making new comics and that is what everybody wants, right? Updates will continue when we have something important to say (or to show), even if we have to twitter it. Khepri is already taking pre-orders for the conclusion of our little PIXU saga. Don't miss out on this internet bargain, and your best bet to acquire the limited edition of the second volume of this horror curse. Since we've been making the Why comics videos, we also meant to show our little participation on this year's Eisner Awards, but when we we're enthusiastically winning the award for best anthology with 5, we didn't film it. Now, more than a month later, we discovered that someone did, and we're finally able to remember what we said up there when we were already high on the happiness of it all. It's up to all of us to make more, and make it better, and keep going. Until we're back, behave. And let's make great comics.